Gandhi Jayanti is the annual celebration of Mahatma Gandhi’s birthday on 2 October – a national holiday in India. 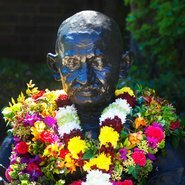 This year, at the Art Gallery of NSW, we will be marking this occasion with a panel discussion centred on Gandhi’s statement: ‘No culture can live if it attempts to be exclusive’. Organised in partnership with UNSW Australia and the University of Sydney, the discussion will be moderated by the Gallery’s deputy director Suhanya Raffel and include UNSW author and journalist John Zubrzycki, University of Sydney political economist Dr Elizabeth Hill and university students Roanna Gonsalves and Sai Sowmya Bysani. Before the discussion begins, there will be a lamp-lighting ceremony and award-winning singer and soloist Heather Lee Cunio will perform two of Gandhi’s favourite devotional songs or bhajan. The events will take place in the Gallery entrance court, where Public notice 2 by Indian artist Jitish Kallat is installed. This monumental artwork uses 4360 bone-like letters to spell out a speech delivered by Gandhi on the eve of the march.